This Chocolate Chocolate Chip Nothing Bundt Cake is rich, moist, and delicious! Our recipe tastes just like the cake you can get at the shop. 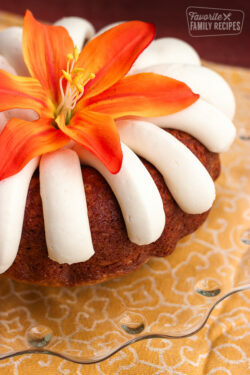 If you have never had a Nothing Bundt Cake, it is time to make one! You will see what all the fuss is about! I have tried my hand at several bundt cakes and this chocolate chocolate chip cake is my favorite. What separates this cake from others that I’ve tried is how moist it is. You’ll be hard-pressed to find a cake as moist as this one. The secret is adding instant pudding mix and sour cream to the batter. It is SO good! Every time I have made this cake I ALWAYS get people begging me for the recipe. It is THAT good, plus it is beautiful! Trust me, you are going to love it! The frosting alone is simply amazing! You’ll be amazed at how easy it is to frost this cake like a pro – all you need is a Ziplock bag and some scissors! Put the frosting into the bag, cut a tiny hole in the bottom corner and get busy! Nothing Bundt Cake Lemon Cake – A sweet, tart cake that tastes just like the original. Mix first six ingredients together in a mixer or with beaters. Stir in chocolate chips. Pour into a greased bunt cake pan (cooking spray works great). Bake at 350 degrees for 45-50 minutes. Remove from oven. Let cool for 20 minutes. Remove cake from bundt pan by placing a plate upside down over the bundt pan. While holding the plate firmly on top of the bundt pan, flip both over so the cake comes out onto the plate. Cover the cake with plastic wrap and place it in the fridge overnight before frosting. Mix in the vanilla, then gradually stir in the powdered sugar. Start with 2 cups then keep adding more until it is nice and thick. Spoon the frosting into a Ziplock resealable gallon bag. Clip one bottom corner of the bag. Squeeze frosting out of the bag onto the cake in strips as pictured above. *Prep time and cooking time does not include letting the cake refrigerate overnight. You have inspired me, this should help me get all of those loose pieces of paper organized. I don’t have pictures but I will have to keep my camera next to the kitchen so that I can add them at a later date. Wow my first bunt cake and everyone Loved it yay ???? My cousin found your blog when she was looking for cafe rio pork recipes. She tried it and said it was perfect. We must practically be neighbors, I live pretty close to the Nothing Bundt Cakes on State. I’ve heard they’re amazing, but I’ve never tried one. I think I’ll just make your recipe instead! easy! Kevin called me Martha Stewart, he was so impressed!!! Absolutely spot on!!! We ordered a Nothing Bundt Cake for Christmas and I wanted to make one for my husband’s birthday when I found this recipe! Delicious! Thanks a bunch!!! I was looking for a recipe for this cake and tried this one, and it was fantastic! I tried it with cupcakes and they were gone in a heartbeat. Thanks for the recipe! How long did u bake your cupcakes? Did you get an answer to how long to bake cupcakes. Mine are in the oven now. ? Making these wed…what temp and time worked for cupcakes? Thanks in advance! Nothing but bundt serves samples that look to be baked in a sheet cake pan…….how long would you bake this choc chip recipe in a sheet cake pan? What tip did you use to pipe this? And did you take the frosting all the way into the middle? (If you aren’t putting a cake topper on it, any suggestions for how to “finish” it? I just used a pastry bag and cut off the tip to the size I wanted. No tip was big enough! Are you kidding me!? I want to eat just their frosting plain! Aack! I always want to pick up a cake when I go see family in Sandy. I'm putting this on my list to make this week. Can't wait!!!!! So, I made this cake for myself for my birthday. THANK YOU THANK YOU THANK YOU!! It was absolutely delicious and I didn't miss the store bought version at all and had a BLAST making it and sampling the frosting as I went! YUM! I'm going to feature it on my blog this next week and link to your blog as well…just so you know! Thanks a million times over!!! I have to post another THANK YOU from another one of your fans! I made this for my book club and everyone ate three pieces and took a piece home! They loved it! I found that it made a TON of frosting, even when I layered it on, I still had about a cup extra. I used big chocolate chips because I couldn't find minis that weren't a strange generic brand. It was delightful! Do you use the large or small box of pudding??? Excited to try today! Do you use a small or large box of pudding? It is the small box. It is 3.4 oz. Thanks for asking! Just the small box, but I'm sure if you used the large box it would be fine. do you just use the powder? does it matter if it’s instant? I have used both regular and instant powders and both work great! And no, I haven’t done the carrot cake, sorry! Ok, so the choice of 3 different chocolate cake recipes is puzzling me… which do I choose? What has been the choice for everyone else? I tried the samples at the Women's expo and it was TO DIE FOR! I just can't justify spending over $30 for a cake though! Thanks so much for posting! Wonderful copy! I made these for my daughter's birthday as cupcakes. And I am making it for Thanksgiving dinner tomorrow. Oh, and I am featuring you on He Married Me For My Cooking. Thanks for sharing! "that's the BEST cake you've EVER MADE"! What is the frosting recipe? I love nothing bunt cakes, but we moved to the east coast and there aren't any out here. Do you have any ideas for some of their other flavors? Like this May they are going to have an almond poppy seed bundt, yum! Loved this recipe! do you know the carrot cake recipe they use?? What size package chocolate pudding? Oh IF you are working on other flavors please keep us posted. I tried the White Chocolate Blueberry the other night, OMG it was a.m.a.z.i.n.g! Please post their turtle Bundt cake recipe or a copy cat!!! I haven’t tried their Turtle Bundt cake yet. Sounds like I need to give it at a try! I need to buy a bundt cake pan, what size is best for this recipe? Just the typical size (I think they are 8-9"), you can even use the little bundtlet pans if you want, just reduce the time and keep checking on them until they are done. I live near a Nothing Bundt Cakes store, but I missed getting my hubby one for his birthday (today)! They were closed when I "dropped by" yesterday evening. So… I'm trying your recipe. It's in the oven!! I'm excited to serve it to him! I'm so excited to try this–it's actually in the oven right now. I am nervous about the frosting. How did you make it look so… PERFECT? Do I need any special instructions? Thank you! I'm so excited I stumbled across your blog. Thanks for sharing your talents! Just made this for my own birthday! It was fabulous!! Thank you!! Have you perfected any other flavors? I am so thrilled I found your recipe. I am going to try it as I am looking for a good gift and this shop is not in our area. Please perfect the other flavors we need your recipes!! Especially red velvet!! I am currently working on the white chocolate raspberry one. I am REALLY close but not quite favfamilyrecipes worthy yet! I will post it as soon as I get it PERFECT! You nailed this recipe!!! It’s now a Fam Fav in our house too… Thank you! Erica, thank you for sharing this recipe! My daughter wants the red velvet nothing bundt cake. Do you think I can just sub out the chocolate cake mix for red velvet? And what about the pudding, stick with chocolate or do a vanilla or something elxe? Use one of those cake mixes or two of them? On the copy cat bunt cake: only ONE box of cake mix, right? This cake is AMAZING! My friend ordered the Turtle Cake for her husbands birthday from Nothing Bundt Cakes and it was delicious as well. I believe the frosting was the same. Perhaps you could try your hand at this one too? 🙂 Thanks again for posting. I’ve seen recipes for “cake mixes” so maybe try one of those then use it in this recipe? This is THE BEST chocolate cake recipe EVER. I found it a couple of weeks ago, and I have already made it three times. I look for any excuse to make it now. Everyone raves about it and asks for the recipe, and they can’t believe it uses a mix. Neither can I. I made it in mini bundt pans first, and that did not turn out well. The texture was not right–too light and fluffy. It was way more dense and fudgy in a bigger bundt pan or a 9×13 pan, possibly because the batter doesn’t have as much to “grab on” to in the oven. Make this cake. So good. Oh, and I have since gone to Nothing Bundt Cakes to try their real chocolate version. I was hoping mine was at least comparable. In my opinion, this one was better. 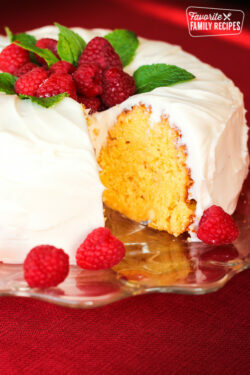 I just made this cake and it is absolutly delish, the frosting is the best I’ve ever had. Thank you so much. Has anyone had success with the mini bundt pan? I bought one of the pans yesterday but don’t know what recipe to use. Would you email me what you have so far?? I am IN LOVE with the white chocolate raspberry and would love to see what you’ve got so far! Email is [email protected]! Does it matter if the cake mix has pudding in the mix? Can’t seem to find the old stand by anymore. My caramel brownies with the german choc cake mix are suffering because of the change in the cake mix. They just don’t set up well at all. Hi!!! I am so excited I found this! I had the nothing bundt cakes at a friends party and fell in love!!! I want it for my sons bday in April! But we will be having at least 100 invitees…so that will get pricey! Dow this recipie also work for cupcakes or in a standard baking pan? Not the bundt ones? It will be Mickey themed so I’d like to make it in a Mickey form! Thanks in advance! Absolutely! Just watch it closely and check it every few minutes after 15 or so minutes. Oh if you like Nothing Bundt Cakes…. Come back here on Monday…. Get excited because I sure am! I could only find mini semisweet chocolate chips at the store, is that the kind you used? Yeah, just whatever the mini chocolate chips are. They just melt better. Milk chocolate or semi sweet.. Either one. I used your red velvet version but made cupcakes. Duncan Hines Red Velvet cake mix. I used milk instead of water. The batter was a little thick. IT WAS AMAZING. My guests that have had this at the Store said it was identical and very surprised that these could be done at home. It turned out 27 cupcakes. I actually made two boxes turning out 54 cupcakes. One batch of cream cheese frosting was enough for all 54 cupcakes, yes 54 cupcakes using the large piping tip and swirl beginning 1/2 from the outside rim spiraling towards the center for the peak. I will be trying the White Chocolate Raspberry next – cupcakes as well. Thanks for sharing. On my previous reply. The swirl began 1/2 inch from the outside rim of the cupcake. Thanks for sharing this! I have had a lot of people asking how to do cupcakes so I will refer them to your comment! Do you remember how long you baked the cupcakes? You are VERY VERY welcome! Your son has good taste 🙂 I am glad you made a memory of it! That is what this blog is all about! I made your cake and it was the best! I’m making it again for a birthday but for ease of portability I am making it in a 9×13 pan. What is the best way to do the icing? Just spread it out or a design like the bundt? Yum! Thank you for sharing with the Clever Chicks Blog Hop! Hi. I have made it gluten free. I just used the Betty Crocker gluten free cake mix and made it the exact same way Turned out great. My friends tried it said just as delicious as my regular cake mix. My husband who has celatic disease loved it. And no side effects so yay!!! Do you use TWO boxes of the Gluten free cake mix…since one box only makes one 9″ round instead of two?? I’m so glad you liked it! This is one of my favorite cakes. It does make a lot of frosting. Adding more powdered sugar next time will stiffen the frosting. I would also recommend letting it sit in the fridge for an hour or so before frosting the cake. I’d like to make these as cupcakes for a teen party. In the recipe it says to grease the bundt pan, but I assume that is to release the cake from the pan. So will the cupcakes work with the cupcake papers, or do they stick to the paper too much? How long do they bake as cupcakes? They should be fine if you do it with cupcake liners, you shouldn’t have to spray them. As fat as the time… I have never made them as cupcakes before so I don’t know what to tell you. I would say try 10 minutes and keep checking them every few minutes after that! If you do it, come back and let us know how long you baked them for. I just made the cake BUT I forgot the pudding! It’s cooling now– should I start over or do you think will be alright? Oh no! I hope it turned out OK for you. My guess is that it was fine. The pudding just makes it more moist. It’s so frustrating to forget an ingredient. It happens to me all the time! Thanks for the great recipe- Nothing Bundt Cakes is the best! Quick question, how long did you beat the mix for? I was going to go by the cake mix box and do 2 minutes but my batter was getting too tough. 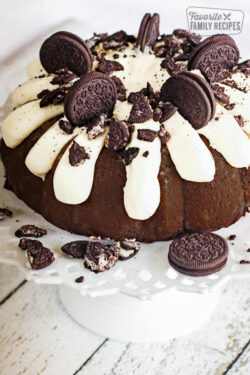 Love love love this recipe, but I would like to make it in a sheet cake pan instead of a bundt cake. Have you done this before and do you know what size pan I should use? Thanks! We have never made it this way so I don’t know what exactly to recommend. If you try it, let us know what you did and how it turns out! hello. What kind of oil do I use? Vegetable? I like to use Canola oil when baking, but vegetable oil would work fine too. Thanks for asking! 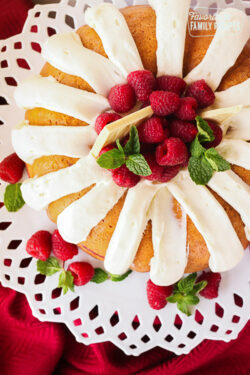 This is fantastic and sooo much cheaper to make than to buy it at the Nothing Bundt Cake store! I found the perfect bundt cake pan at Goodwill and thanks to the Wilton cake decorating lessons I took, my family thought I bought the cake from the store. Thanks so much for sharing! So glad you liked it (and loving that you fooled your family)! Thanks so much for the nice comment! Will your recipe work in 2- 8 inch pans to make a layer cake? What I have in mind is a 2 layer naked cake. Planned on frosting in between the layers and slightly around the cake. Thoughts if it would work this way? Did you end up making it in the 8 inch cake rounds? Curious how it turned out. I only have one large bundt cake pan but want to make two seperate cakes with one recipe. Should I still add pudding mix if the mix i use already has pudding in it? Thanks so much, this looks great! Can’t wait to try it. Love this cake! We’ve been making for 30+ years now and it’s always a favorite, but we top it with powdered sugar. I’ll have to give the “icing” a try! This cake looks divine!!! But, I’m a little confused. The video looks as though you added 1/2 stick of butter, and the recipe says to add 1/2 cup (which as you know is one whole stick). Did I miss something? The frosting calls for 1/2 cup of butter, not 1/2 stick. Thanks for asking! okay im making this AS WE SPEAK! I hope you get this message today and not like I. 3 months because this post seems to be from 2013! do I HAVE to refrigerate it overnight?! I want it like now! no but seriously, dinner is almost served and I only want to wait as little as possible after it’s done to eat it! are you only refrigerating it for the coldness? thanks so much! My husband is drooling! We have just found that the cake stays more moist when wrapped and put in the fridge, and it is more similar to a Nothing Bundt Cake when served cold. Thanks for asking! I have been making this cake for most of my married years (47) and it is without a doubt everyone’s favorite and so easy to make. I got the recipe from my mother. I have baked and served it, and frozen it and used at a later date. I never ice my cake, but sprinkled it with powdered sugar. My daughter uses icing. It’s great no matter what the occasion. Definitely try it. You won’t be sorry. You can make it as a sheet cake also. Thank you, Elaine! I’ve never used this recipe for a sheet cake. Good to know! Do you have a red velvet bundt cake recipe? I would love to see it if you do.Email is [email protected] . We don’t, but that is a great idea. We will work on it! I own a Nothing Bundt Cakes store and while I’m sure your cake tastes great that is not our recipe. I just had this cake yesterday and noticed there seems to be a very light caramel sauce under the frosting and maybe a touch of raspberry. Have you tried one from the store recently? We haven’t but that sounds delicious! A chocolate Raspberry one is SUCH a good idea! I am looking for a lemon cake anything bundt. Hi there!! This may sound like a silly question, but what kind of flower did you use as the garnish/decoration? Is it real? Or fake? Making this for a friends birthday, and the flower gives it that extra touch. Hi there!!! This is probably a silly question, but what type of flower did you use as garnish/decoration? Is it artificial? Or real? Thank you! Hi Roxy– the one in the picture is a fake flower. haha I even think there are some feathers in there with it! The cake we made in the video, however, we used real roses and I think that way is much more beautiful. We need to re-take a picture with roses instead! Yes, you can use Greek yogurt! Hope this helps! I made this before we even tried a Nothing Bundt Cake. We loved it. Then we tried the NBC version, only thought was mine was a lot more dense. Any thoughts? The real one sort of melted in your mouth but this was dense. Still loved it though. My version came out pretty dense. It was delicious and we hadn’t tried Nothing Bundt Cake yet. We had the chance to try some after and their cake was moist and fluffy. Did I do something wrong in the process that mine became so dense? Hi Brianna, if you want a lighter, fluffier cake, here are a couple of tips for you. First, sift the cake mix two or three times. This will make the dry ingredients finer and eliminate the salt chunks that are often in cake mixes. Second, separate the eggs. Add the yolks when mixing the ingredients. In a separate bowl, beat the egg whites until they are white and fluffy. Fold the whipped egg mix into the cake batter and then add the chocolate chips. It’s a few more steps, but it will make the cake lighter. Reply: Thank you Mildred! I hope you enjoy the cake! I tried this recipe today! It was sooo good! I can’t wait to try the others. I made one for friends and everyone loved it! I plan to try other flavors. My only problem was that the cake caved in the middle. This has happened both times I made one. What am I doing wrong? I’m not sure… what kind of bundt pan are you using (ceramic? non-stick? etc..)? Hi. I love love your recipes. Used to make it all the time. Then husband found out he had cealtic. Gasp. What was I to do. I found Betty Crocker gluten free cake mix in place of regular cake mix Everything else is gluten free. To quote my husband “this is too good to be gluten free”. The only other thing I had to do was grease my pan with crisco and coco powder or my cake wouldn’t come out. Now if they made gluten free lemon cake we would try the lemon cake. I did a marble cake. Using your recipe. Just switched out yellow cake and vanilla frosting. For the yellow part of the marble. Excited to try the flour free cake and the 4 ingredient cake as well. Thanks. Keep the recipes coming. Can’t wait to try this one! Can you tell me what size of pudding? Appx. 5 oz. (usually 5.1 oz.) Hope this helps! Thank you! The small pudding is 3.9 and the large is 5.9. I will try the large one. I’m making it this week. I want to make a lemon raspberry one. How would you make it to be as close to Nothing Bundt Cakes? Have you tried making bundtlets with this recipe? If so, what would the cook time be? I haven’t made bundtlet with this recipe, but I think it’s a great idea. I just need to get a bundtlet pan. I would suggest 10-15 minutes. You can use the toothpick test to tell when they are done. Be careful not to overcook. Please let us know how they turn out! If I wanted to make this a red velvet cake would I just exchange the deviles food for red velvet cake mix? Thank you!! Yes, that will work great. You can still use a chocolate pudding mix, but the color will be a slightly darker red. You can also use a vanilla pudding mix. Thank you for asking! I’ve something very similar to your recipe, except I didn’t use mini chips. Get complements every time– and I don’t even frost it! Sometimes I sprinkle a little powdered sugar for looks. So good. I’m going to try some of your other versions like the lemon and white chocolate raspberry. Yumm! Has anyone not refrigerated it over night ? I left it in the fridge for about 3 hours then iced it. It was fine and the family LOVED it. Need some advice on baking this. Does anyone else have an issue with how long to bake it? It seems like parts are still raw but then the sides get too done. When I do the knife test after 50 minutes there are areas that are raw but I can’t tell if that’s just the pudding needing to set. Should I just pull it out at the 50 minute mark? This cake is so amazing I want it to be perfect! The recipe calls for 3/4 cup powdered sugar but the directions say start with 2 cups. I’m so confused! Sorry this was unclear in the recipe. You will want 3-4 cups (3 to 4 cups) Hope this helps! Thanks for sharing what you did to adjust for your oven. And glad it still turned out great! I made these today as cupcakes since i didnt Have a bundt Pan. I baked Them at 350 for 28 minutes and they’re perfect! Thanks! Thanks for sharing your method making them as cupcakes! This will be a huge help to many readers. Glad to hear they still turn out great! Does the cake need to be kept in the fridge? Assuming there would be any leftovers….. Yes, you can. Just check them after 8-10 minutes or so and keep checking until done. Hope this helps! We love the Nothing Bundt Cakes but only get them when we are on vacation. I was excited to try this recipe. It was a hit! I’m going to try a Red Velvet cake next. Thank you. So glad you liked it! We are huge fans here too. Let us know how you like the red velvet! Partially melt butter and mix that by itself first. Add cream cheese and mix until fairly smooth. Add powdered sugar and vanilla, mix an low first, then on high. One last thing if you want the frosting to look just the the actual thing, start from the outside of the cake, about a half inch from the bottom. Thanks so much for the suggestion! And thanks for the frosting tip (going from the outside to the inside). It’s always nice to get suggestions form past employees. We love it! … and what is in real recipe? Can you share? Does it need to go in the fridge for a night before frosting? If so why? Thanks! Can’t wait to try it! After it cools down a but, it just makes the cake more moist. Just make sure it’s wrapped up so the moisture stays IN the cake 🙂 Hope this helps! We typically use salted, but you can use either! Hope this helps! I cannot wait to try this recipe for a tailgate. I really want to use more than one color batter (ie make it team colors if possible). My original thought was to use a white mix and color…but I think the best option is red velvet then perhaps color the frosting or use team color sprinkles…..thanks for the recipe. I love that idea! Who’s your team? Such a fun idea to make it for a tailgating party– the fans will love it! I also love this recipe! I substitute a mixture of peanut butter chips with the chocolate chips! So yummy! So glad you liked it! Great idea using PB chips! YUM! Do you need to do anything different if baking in Utah since it is at higher altitudes? You should be fine 🙂 This recipe was actually created when I lived in Utah so you should be good 😉 Hope this helps!